Following the Korean War (1950-1953) the United States Army began to realize the value of the helicopter as a modern weapon system. 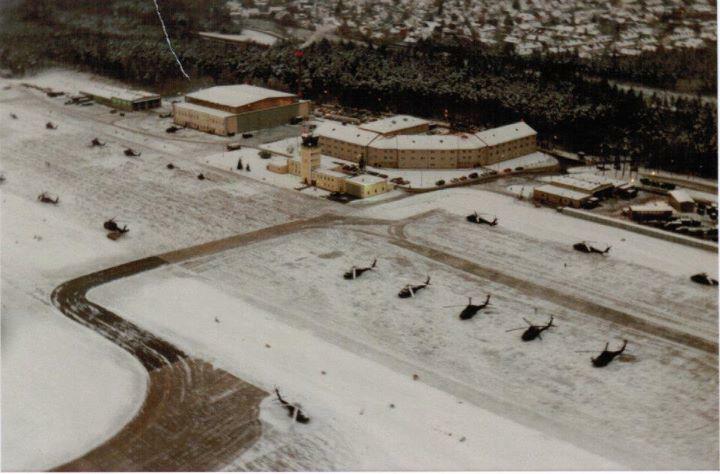 Helicopters could access places and overpass terrain which slowed the ground troops and loiter longer providing more precise overlook into the battle space. 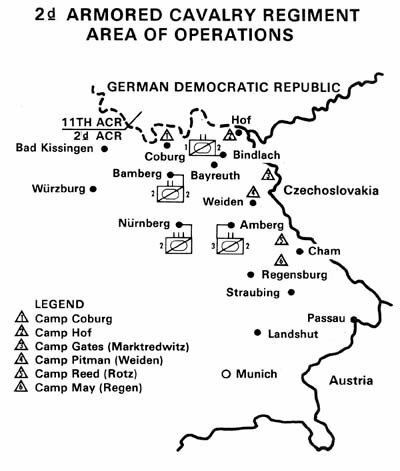 With the Army in Germany tasked with defending against an ever present threat of invasion by Soviet & Warsaw Pact ground forces, the need for constant observation of the sensitive border region became more and more precedent as the situation between the West and East grew more and more intense. Using a sophisticated system of camps and observation posts snaking along the border with East Germany and Czechoslovakia, the United States using ground troops and airborne elements provided constant surveillance of communist positions and troop movements along the border; always looking for signs of an invasion. A map showing the locations of 2ACR border camps in conjunction to their main headquarters along the East German/Czechoslovak border. These units would be ready to respond and conduct operations within a moments notice of offensive operations by Soviet & Warsaw Pact forces. With the introduction of the dedicated AH-1 Huey Cobra gunship in Vietnam, the Army began to expand the role of the helicopter into an aerial close support platform. UH-1 Iroquois utility helicopters would provide transportation for personnel and supplies and the AH-1 Huey Cobras would provide security for the transports. 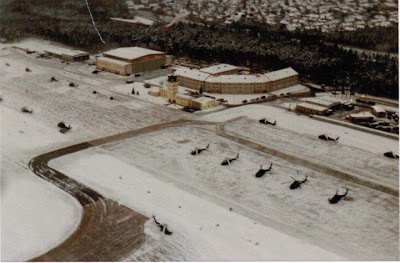 OH-58 Kiowa helicopters would serve as observation platforms, scouting ahead with observer teams to radio troop movements and suspicious activities back to waiting response teams. 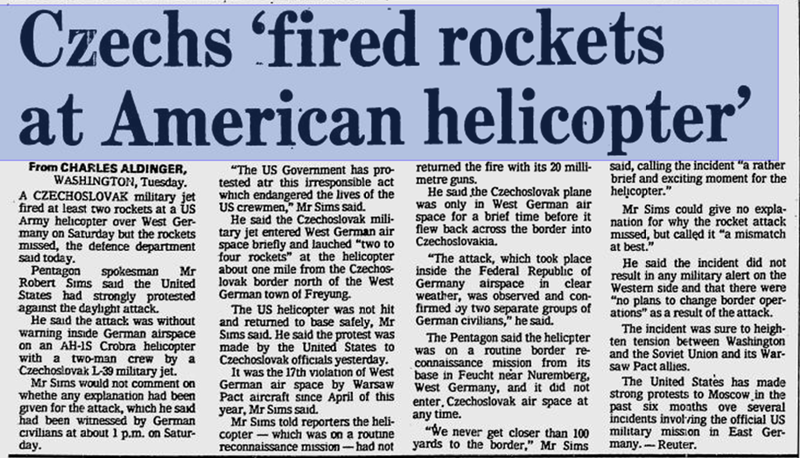 Newspaper article from 1985 detailing the incident between a Czech Air Force jet and a U.S. Army Cobra gunship. 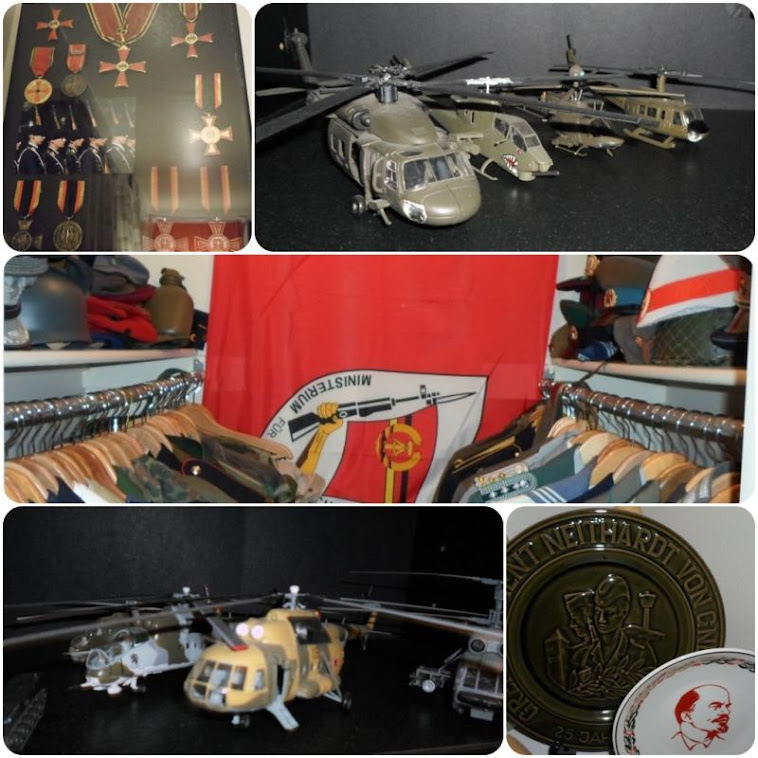 These missions were not always uneventful, the pilots would also be watched; met along the border by Soviet or Warsaw Pact aviation units flying along the same route effectively ‘shadowing’ the patrolling aircraft along the border region. Incidents although rare did occur. 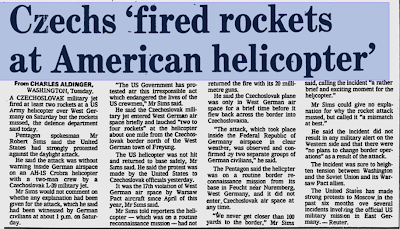 One event in 1985, detailed a Czechoslovakian Air Force L-39 Albatros jet straying across the border into West Germany to attack an AH-1 Cobra helicopter. The aircraft firing unguided rockets at the aircraft breeched West German airspace to attack the helicopter before disengaging and returning to Czechoslovak airspace. Emergency landings and malfunctions of equipment in the sensitive regions along the border also resulted in the launching of quick response teams who would respond to the site and recover equipment and their crews before communist forces would arrival and possibly initiate an international incident. The uniform displayed here would have been worn by a commissioned officer in the United States Army aviation branch. On the collars were worn rank insignia, and in the case of officers the rank was worn on the right lapel and on the left, the insignia of the branch of service. On this uniform the rank patch has been removed but would have displayed a commissioned officer’s rank (2nd Lieutenant through General) and the insignia of the United States Army Aviation Corps on the left collar tab. On the left of the uniform over the uniform breast pocket was embroidered the branch of service which has been removed in this example. Also in this example worn in succession over the branch tape would be specialized qualification badges awarded to the wearer. This uniform bears qualifications of a Senior Aviator’s Wings, Parachutist's Badge & the Air Assault Badge. The unit patches worn on the sleeves signify the wearer was assigned to the United States Army Special Operations Aviation Regiment based out of Fort Campbell, Kentucky and had served with the 18th Airborne Corps out of Fort Bragg, North Carolina. These field uniforms were worn with a brown t-shirt underneath and polished leather black boots. When flying however, this uniform was replaced by a green one piece Nomex fire retardant flight suit uniform and the name, branch of service and rank was worn on a leather name patch worn on the left side of the uniform. For officer’s rank insignia were worn on the shoulders of the flight suit. Beginning in the early 1980’s the Bell UH-1 Iroquois gradually began to be phased out of front line service with American forces in Germany and replaced with the new Sikorsky UH-60 Black Hawk helicopters. The Black Hawks could fly faster carrying more payload than the Iroquois and had better survivability. For typical operations along the border, American combat aircraft would fly unarmed in a move not to provoke communist forces only the crews would be armed for strictly defensive measures. Their Soviet counterparts however usually flew fully armed and ready for offensive combat operations.